I have a definite weakness for old, vintage, and antique linens. Today I stumbled across a bunch of beautiful heavy cotton pillow cases with the hand done crochet tatting at the edges of each pillow case. The pillowcases are in perfect condition with no holes or split seams. They have yellowed with age and that is why I have them soaking and what I use for almost all of my old linens- Restoration. I have spoken about this product before. Restoration is by Engleside Products. I used to use Biz and other things, but this is far superior and gets out more stains than I’ve ever seen with any other product. I will soak these pillowcases in Restoration overnight and then rinse well and possibly wash again in Woolite and then dry on a drying rack. These pillowcases will need to be ironed but they’re lovely. And a good tip for when you are ironing old linens is to do it on the reverse with a colorfast towel in between you and your vintage/old/antique linens. And I know how awesome these are going to be once the yellowing lifts off them. I really like the feel of old crisp pillowcases. Old linens are just the best. People think that they are off-limits because they either shouldn’t be used because they’re old, or or too difficult to use because they’re old. It’s like your old china and silver and glassware – who are you saving it for ? 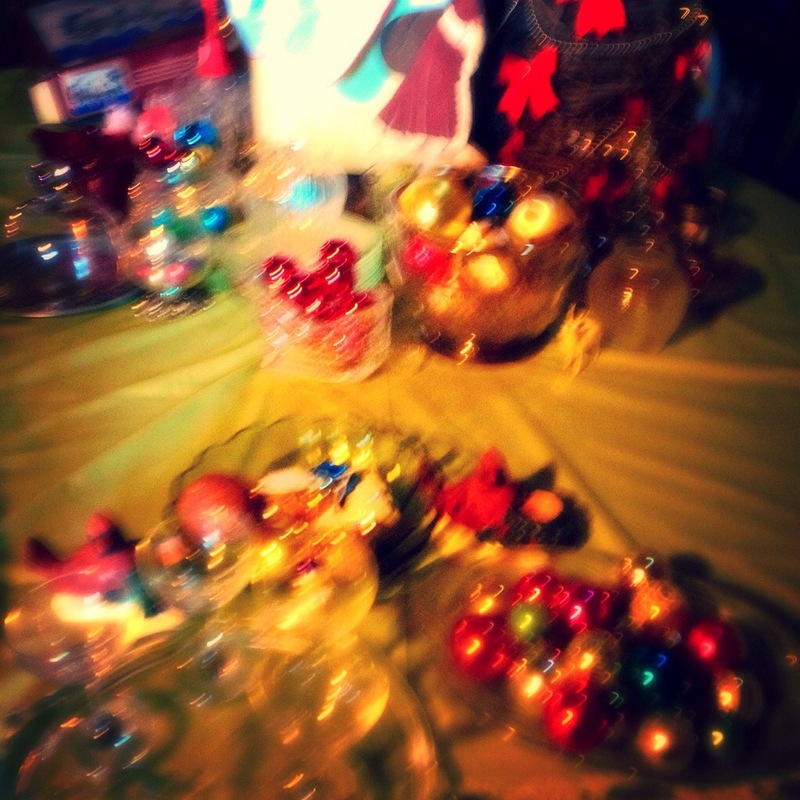 Use these vintage things. Use these antique things. They were meant to live not live like they are in a museum in your blanket chest or china cabinet or linen closet. I like my old stuff, and I use it. I have also written before about vintage quilts. When I pick these pillowcases up they are never too dear in price and don’t be afraid to ask for a better price from a dealer. I use them and when they wear out I often give them to people that work with textiles to give them a second life in something else. The picture at the bottom of this post is one I found on the Internet of pillowcases someone else had that they were selling on eBay. I just want you to have an idea of what I bought looks like since all you see is them soaking in the sink. The pillow cases I have soaking have triangular edged tatting. En Blanc party season is here and your tables aren’t the only thing that need white accessories. 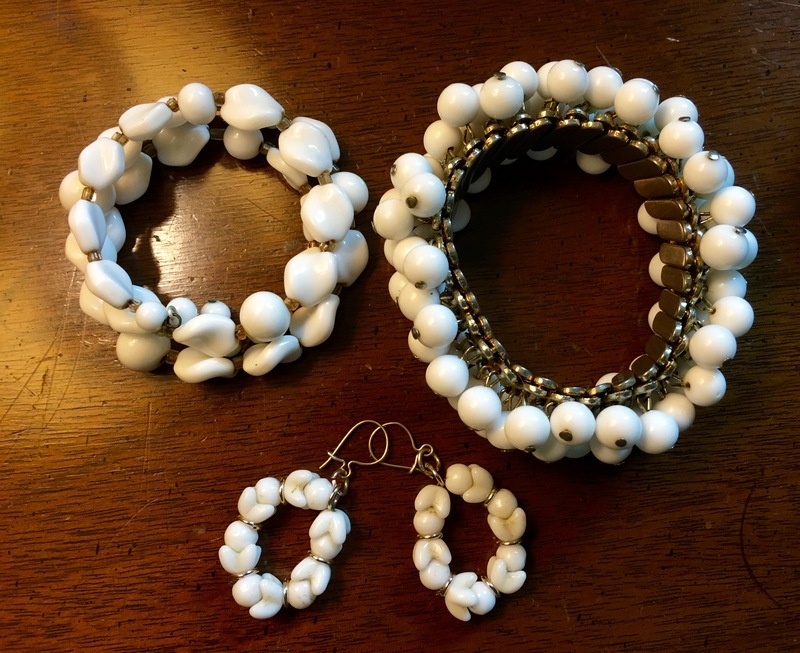 I decided I would hunt out vintage milk glass jewelry that was popular in the 40s through the 60s and I scored some awesome stuff for pennies and voilà! All I had to do was take the vintage dangle earrings off their screwback tops and add them to a wire back. Next to the earrings are two bracelets. I already had white milk glass simple beaded necklaces that I think were my grandmother’s. I’m not sure where they came from I have literally had them in a box for years and I remember playing dress-up with them. Storage Decor is defined simply as something that has a dual purpose: it is beautiful to look at and provides storage. We have a modest sized house so storage needs to be creative. Old furniture has new uses. My first example are antique washstands. You can find them almost anywhere. I see them all of the time in Chester County. 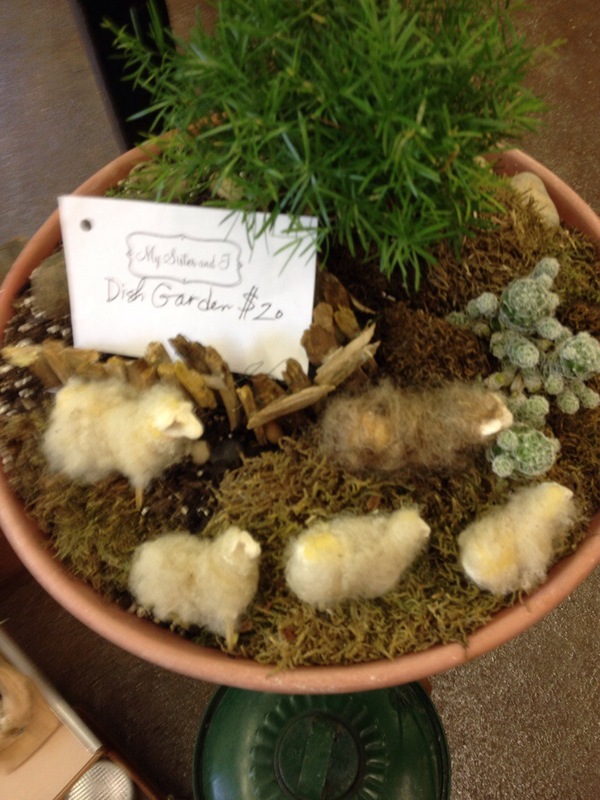 I’ve seen them in barns, I’ve seen them at garage sales, I’ve seen them at tag sales I’ve seen them at resale shops, I’ve seen them at antique stores, and vintage repurposing stores. I have two washstands. They have been handed down in my family and they aren’t particularly fancy and they are definitely more country pieces. Their value is sentimental. They came from my grandmother’s family in Lancaster County. Anyway, one washstand is in my dining room and it is storage for glassware, table linens, and taper candles. The other washstand is in my bedroom and I use it to act as a vanity table on top and in the storage area it’s a great place for scarves and stockings and purses. I love the old wood of these washstands. But I have also seen them painted where they look very pretty as well. I’ve also seen people actually cut a hole in the top of these washstands for a modern basin in a powder room. I have seen people use them as hall tables too. My other favorite of country storage decor are trunks. Old steamer trunks and simple country wooden trunks with hinged lids. 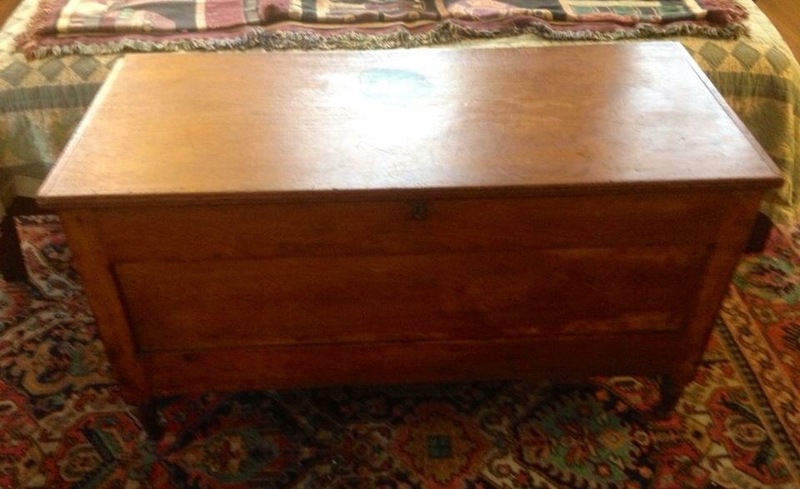 Old blanket chests. I have a few of these trunks and none of them are hiding in the attic. I use them as decorative furniture pieces as well as for the practical purposes of storage for which they were intended. When it comes to these trunks I love the patina of the old wood. I would never paint them. 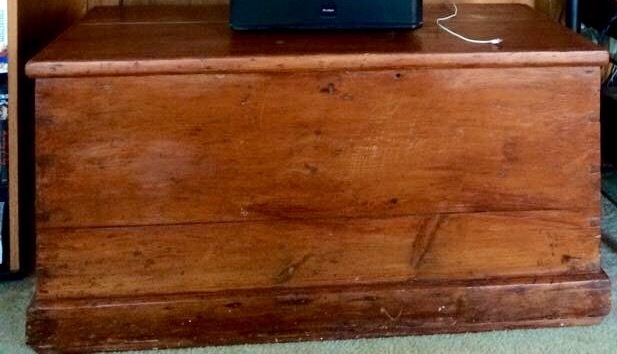 I know people who love to paint any piece of wood they own, but when it comes to these old trunks their real beauty I think is in their scars and wounds of their age. The trunks I own are simple country pieces. I oil the wood regularly and the patina is so lovely. And old trunks are terrific storage pieces also. When I lived in an apartment I also used trunks for storage and decor. I see a lot of these pieces I like regularly at places like the Smithfield Barn and Resellers and ConsignIt , Facebook yard sale group pages, just to name a few places. And you definitely don’t have to break the bank to acquire one of these pieces. 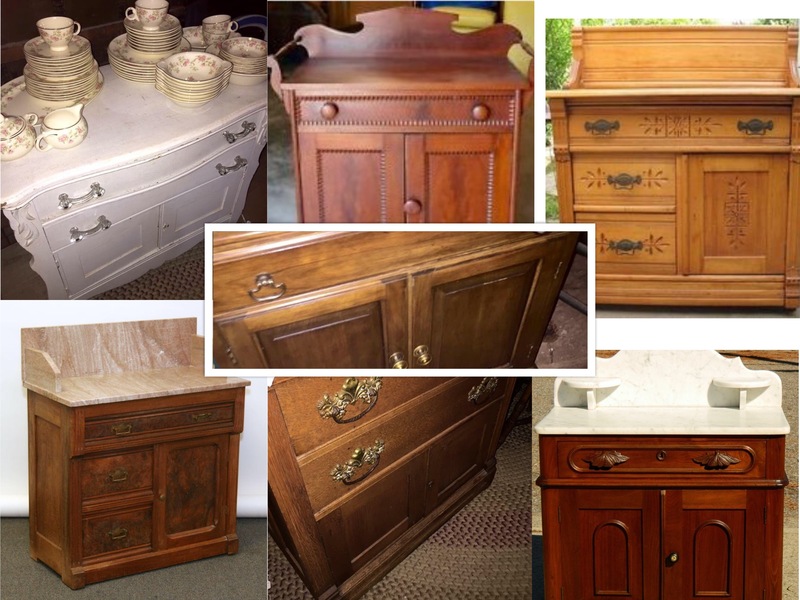 Don’t be afraid to bring home a dusty old piece and make it your own in your house. You’ll be glad you did! christmas in july barn sale! It’s Christmas in July! The Smithfield Barn is open tomorrow Saturday, July 26, 10 am to 4 pm! 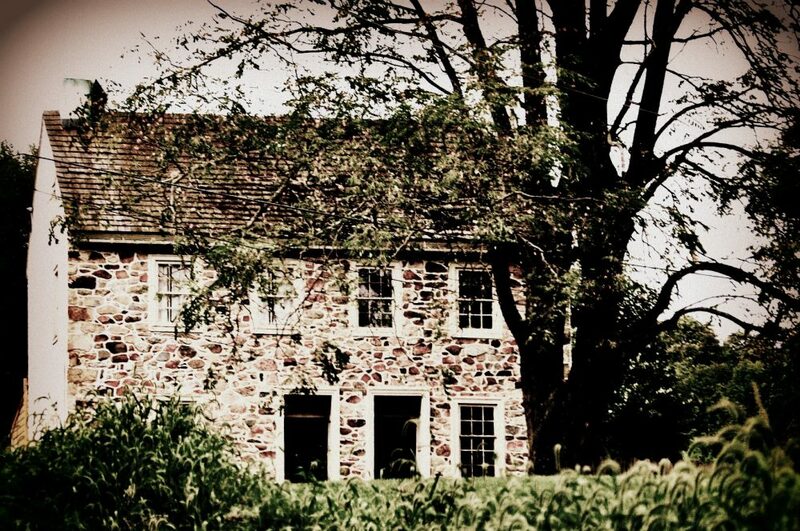 425 Little Conestoga Road in Downingtown! 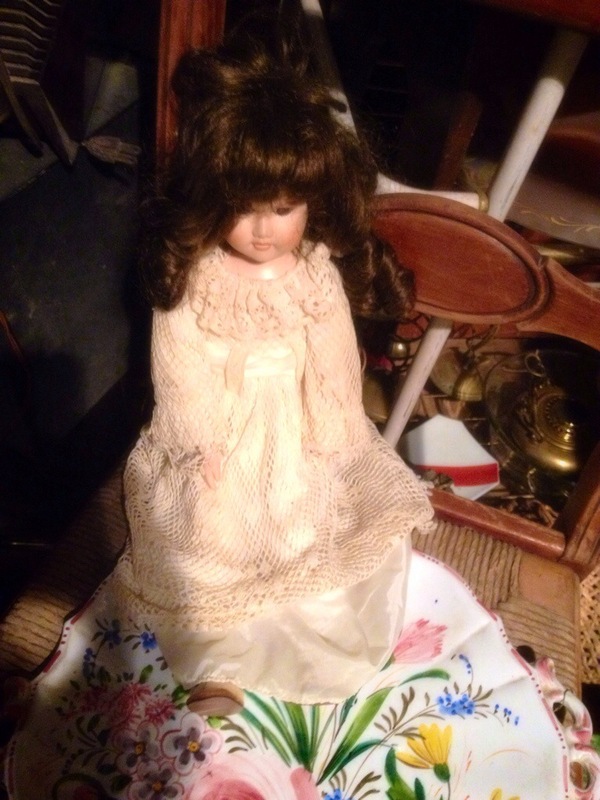 This is a barn clearing sale loaded with furniture, vintage china, vintage linens, tons of vintage Christmas ornaments, vintage fishing rods, tools, you name it it is there ! Cash and carry works best! imaginative repurposing ! 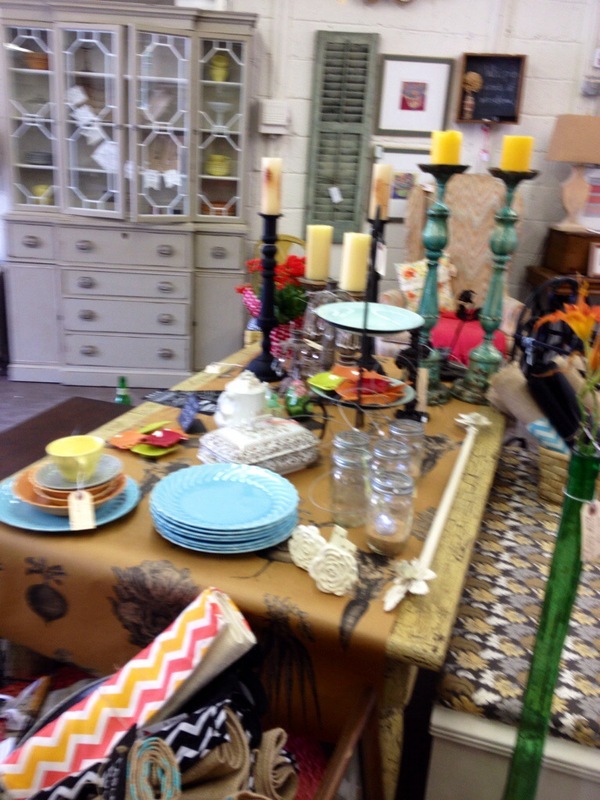 If you love Garage Sale Chic Chester County and fun new businesses like Vintage Chicken this is a business you are going to want to get to know! This group of local artisans travel around Chester County looking for treasures to reimagine, repurpose, and gussy up for your home! 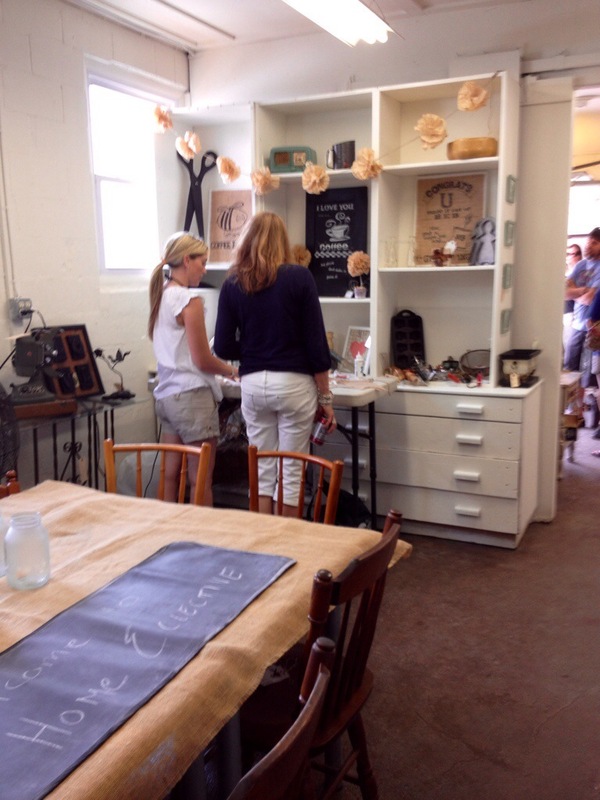 And…even better is they will be doing demonstrations and little “how to” classes too! 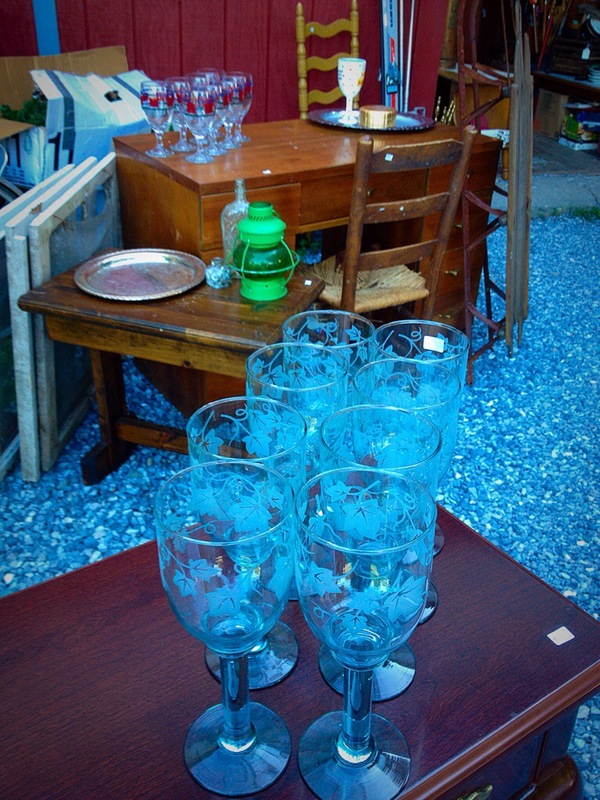 If you like vintage fun like you can find at Brooklyn Flea or Clover Market, you will enjoy this business tremendously! They are open until 6 pm today! Contact them directly for hours and other information – and you can “like” them on Facebook! Anyway, I had picked up this vintage handmade lap quilt at the Smithfield Barn but hadn’t had time to re-band and repair it. I had all these cool remnants of fabric from the barn as well. I also have yards of this cotton lace I had picked up a few years ago at St. David’s Fair. I love hand made and vintage pieced and patchwork quilts, but I am not a quilter. 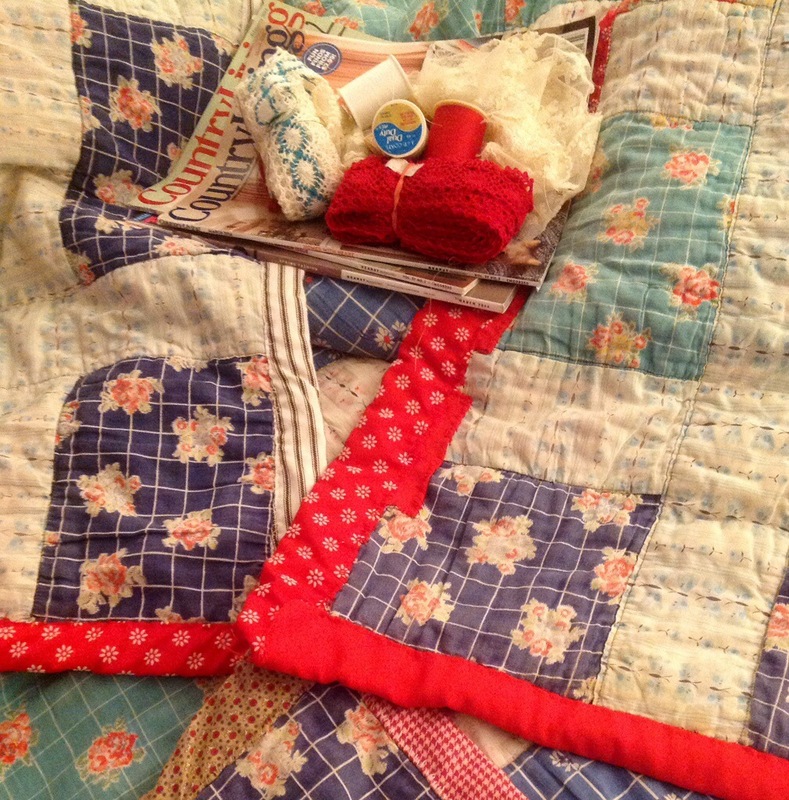 But I have repaired quite a few vintage quilts now, adding my own touches. Sometimes some ribbon, or fabric, or lace, or even a little embroidery. I do hand stitching because I am not really adept at using a sewing machine the way my mother is. I bought the lap quilt because it is a great size in addition to liking the fabric squares in it. It is a little over five feet and is square in shape and it is very heavy and warm. The quilt was a little beat up so I have been stitching away. I am on the last piece of re-banding. I sewed a few hours straight today and wow my hands are sore! Once I finish the basic re-banding I will then finish any patching left in the body of the quilt and then I will do the corners and layer on some other touches. When it’s done it will make a great quilt to curl up on the sofa with. Will it be perfect? No. I am experimenting to see if I like it, but it will once again be usable. And cheerful. Some people collect vintage quilts for display but I like to use them. To me a vintage quilt is home. My mother has a couple that came from my grandmother’s people in Lancaster. I have her crocheted afghans. All of that to me is home. And that is the great thing about making and creating your own home: to have your home carry the happy reminders of past lives forward. File under new uses for old stuff. 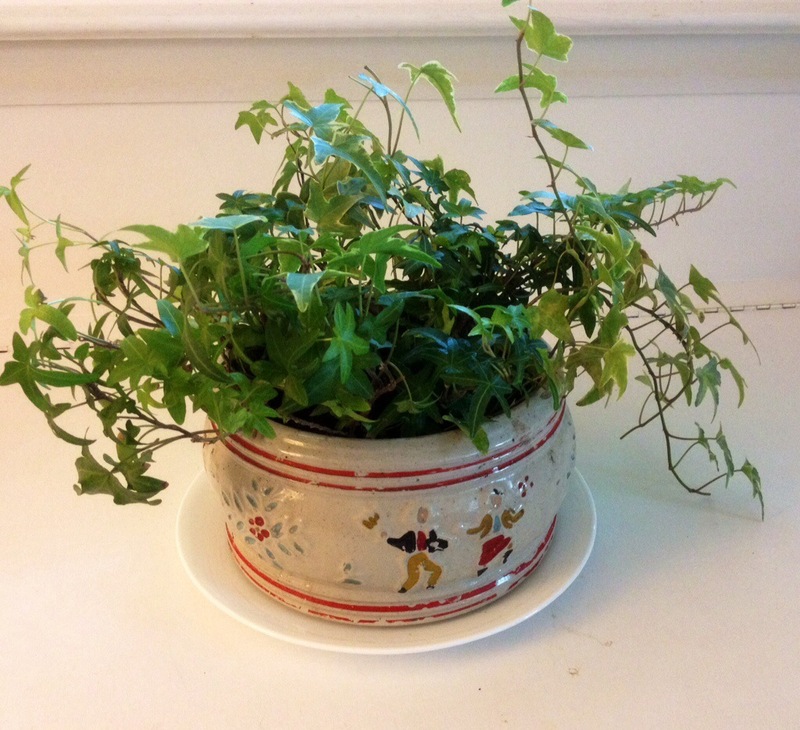 I’ve been hunting around for a container to combine my two houseplant ivy plants into one pot. Found what I needed at my favorite picking site, the Smithfield Barn last weekend. It’s a vintage piece of crockery/pottery of unknown age and precise origin. By my guesstimate I figure it is anywhere from the 1930s through the 1960s. Also given the folk art people, I expect it’s from Lancaster County. 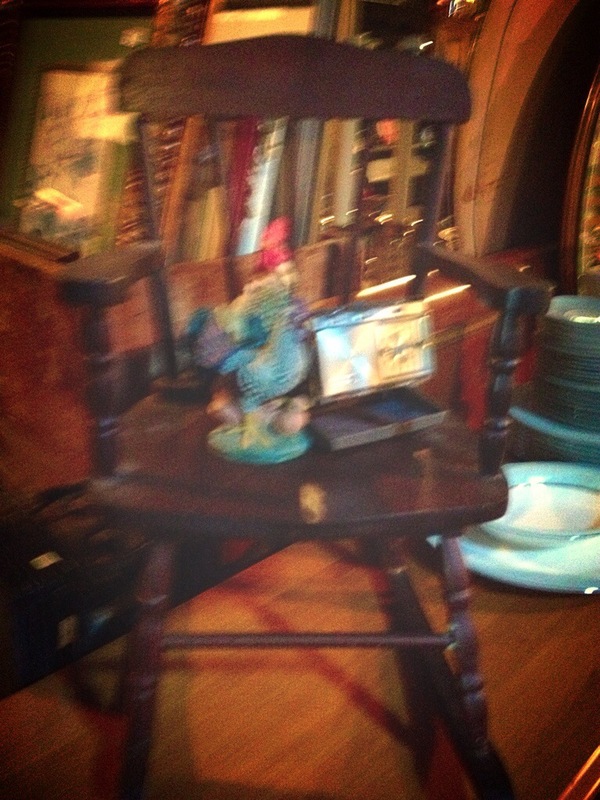 I am thinking it was one of those tourist pieces, like the little cast-iron people I have sitting on a bookshelf. I did not drill holes in the container, in case I get tired of using it for a planter someday. I did put some sand and rocks on the bottom, pebbles actually and planted. Voilà! Adaptive reuse, vintage style.